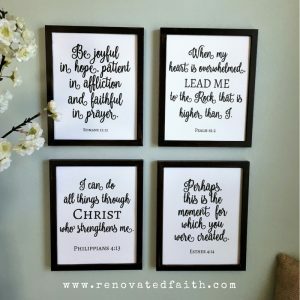 With this step-by-step guide, I show you how to make your own farmhouse style windmill wall decor for less than $20. 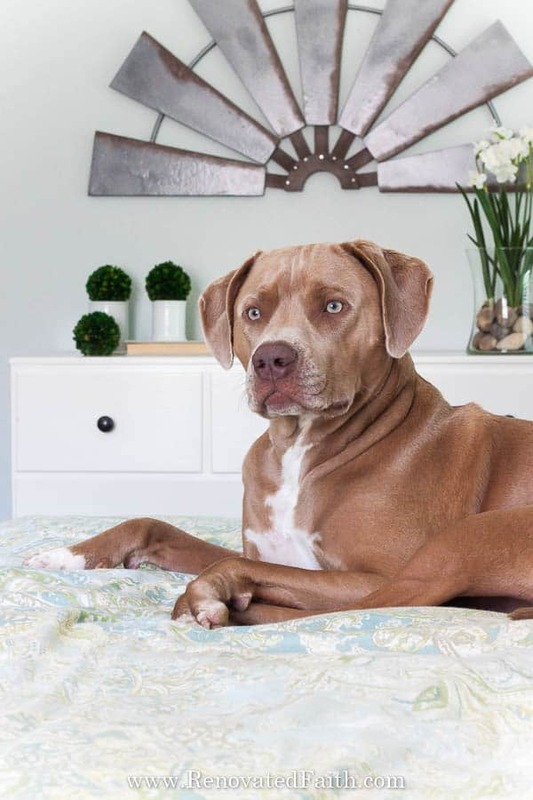 This tutorial is easily customizable for whatever size you need to fit your home’s decor. By using ceiling fan blades and this floral craft ring, you can make this beautiful windmill wall art to hang in any room of your house or even outside on your porch. You see them everywhere! 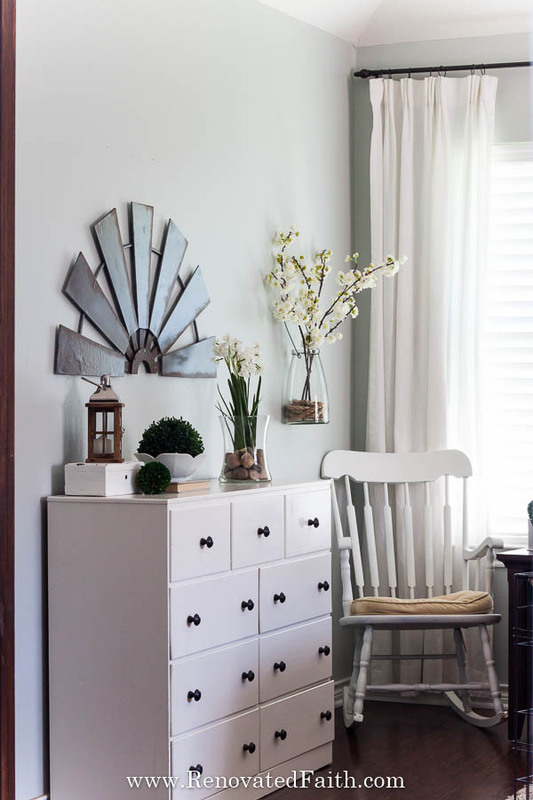 Whether you are a farmhouse fanatic or not, windmill decor is such a cute way to decorate your home. I’ve had my eye on one of these for a while now but often times, the size wasn’t just right, or the price was way too high. I also wanted a half-windmill for over a dresser in our Master Bathroom and didn’t want one that looked too “rustic-y”. Is that even a word? 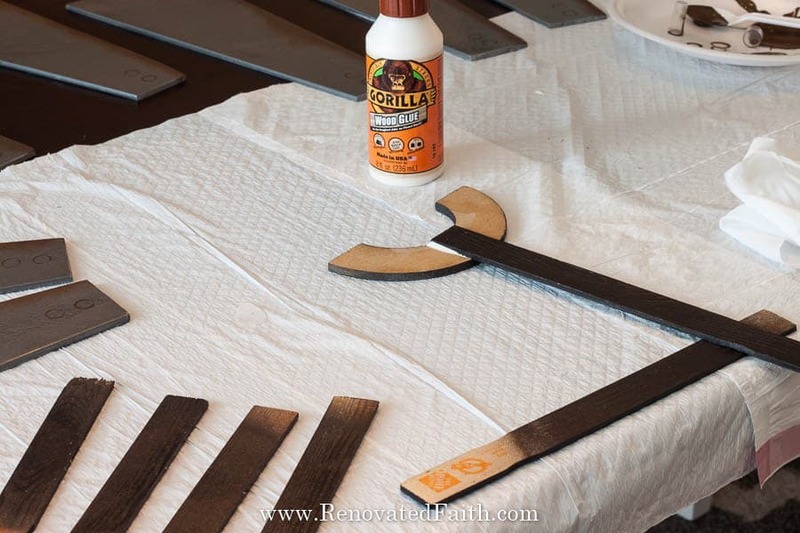 During this process, I learned how to use a jig saw and this one was incredibly easy to use. Check the current price here. 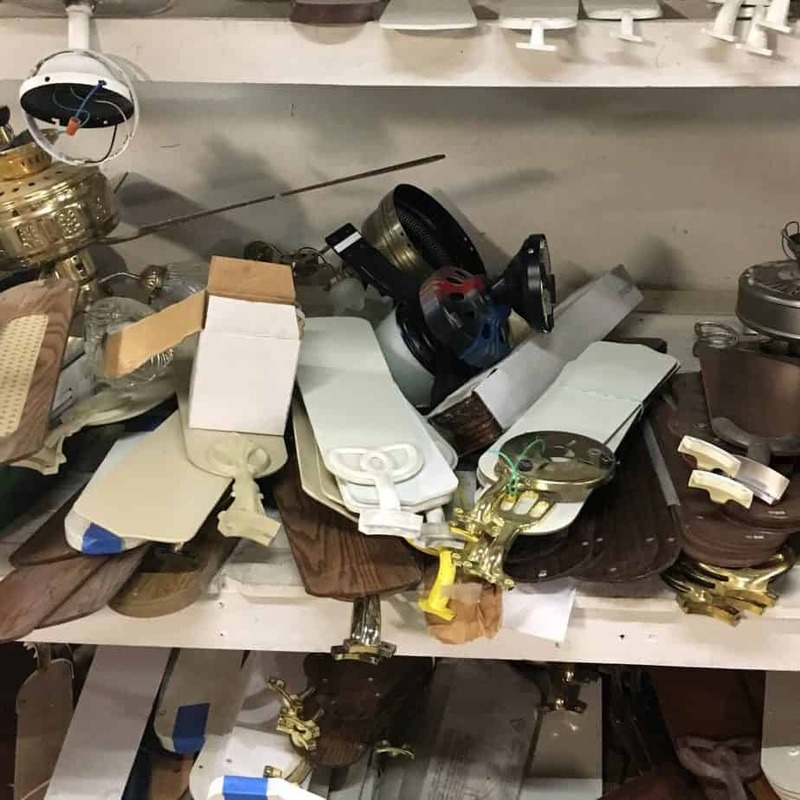 7 Ceiling Fan Blades from your local Restore. 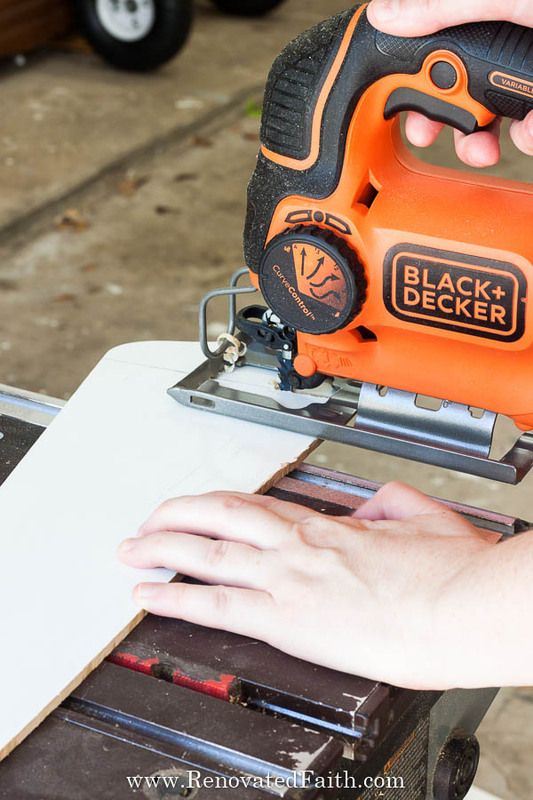 Jig Saw – I love this Black and Decker Jig Saw. See the current price here. 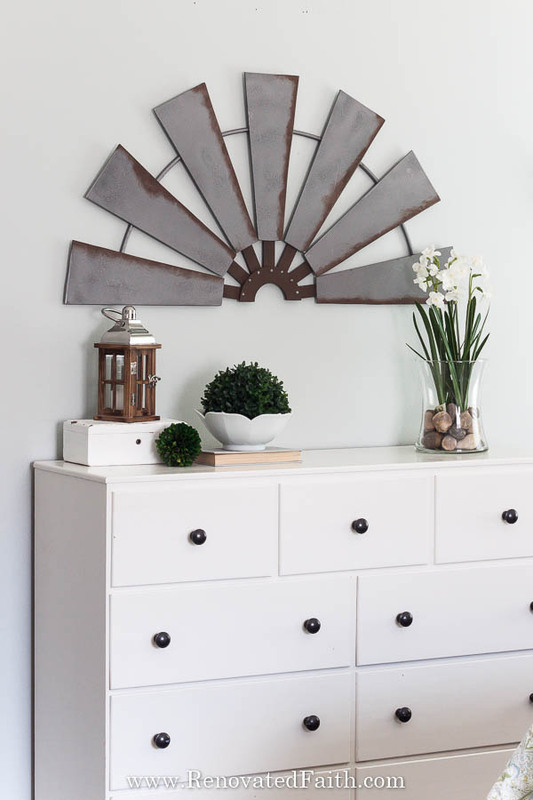 Rustoleum Universal in Weathered Steel – you can also find it at Home Depot. Rustoleum Universal in Hammered Brown – or any brown that resembles rust. 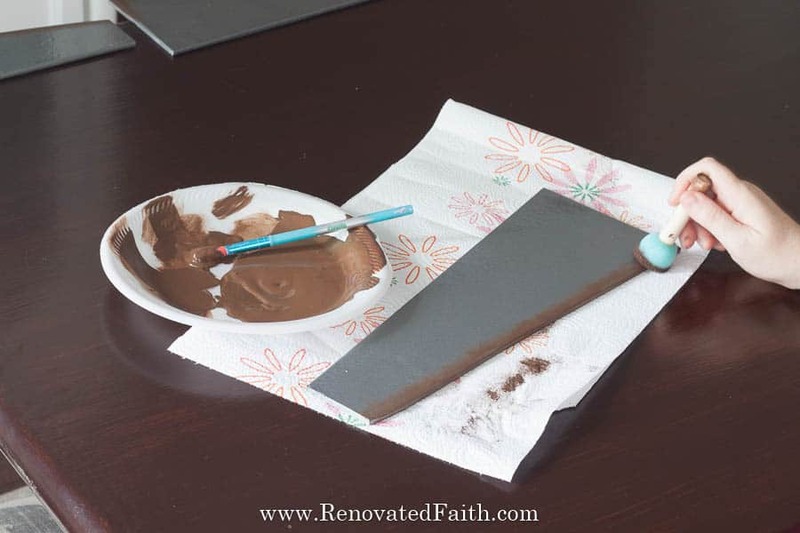 7 FREE Paint Stir Sticks from Lowe’s or Home Depot (Do not use the thin ones at Walmart.) – They don’t mind if you grab them and are not buying paint. I asked! 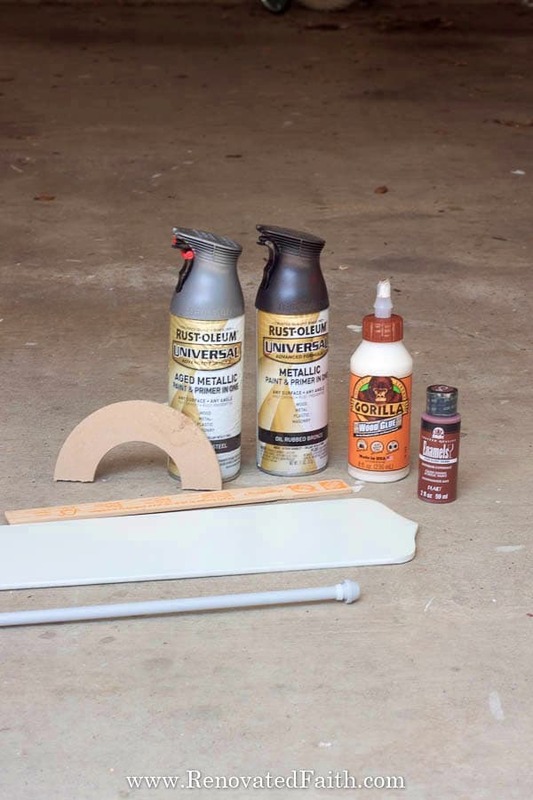 Gorilla Wood Glue – See the current price here. 30″, 3/8″ Faucet Connector (flexible faucet supply line) at Lowe’s – click here for pic. 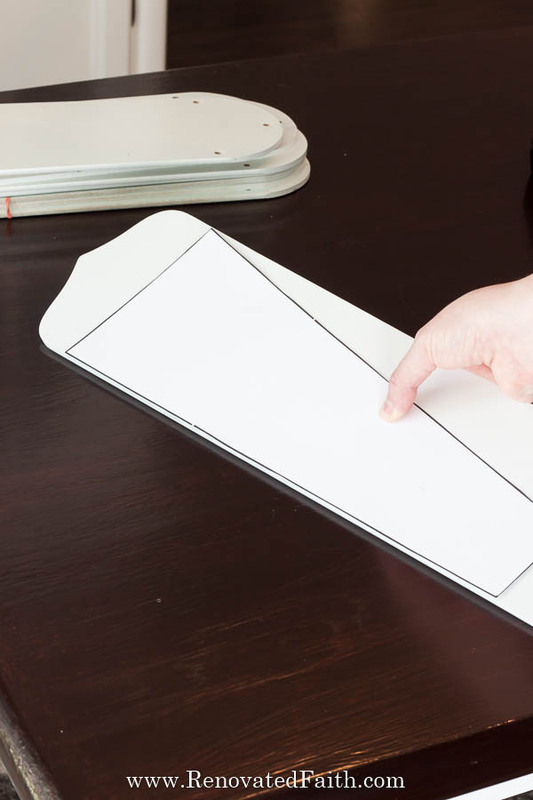 First, you need a template for cutting your ceiling fan blades to size. To print out my pre-made template, click here. 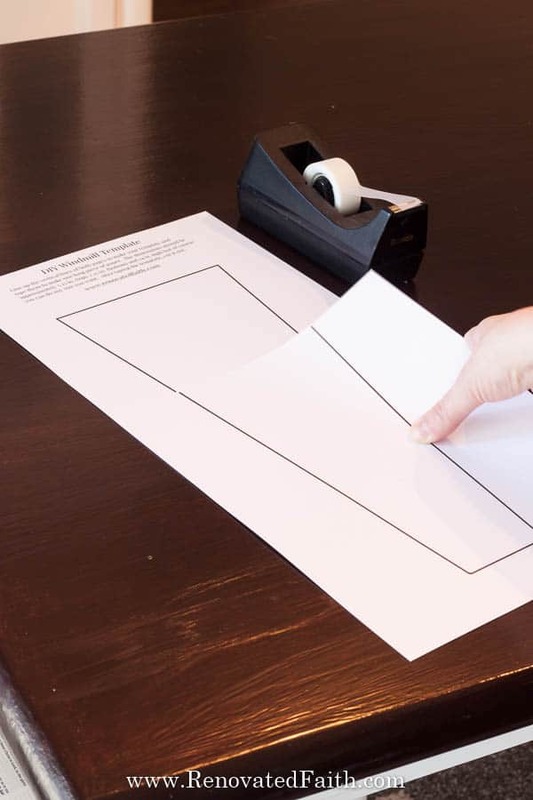 Print the two-page template on card stock or other heavy paper that is easier to use for tracing. Tape the two pieces of paper together so the two long sizes of the blade line up evenly. The pieces of paper will overlap; just line up the black vertical lines. Cut out the template on the black lines. 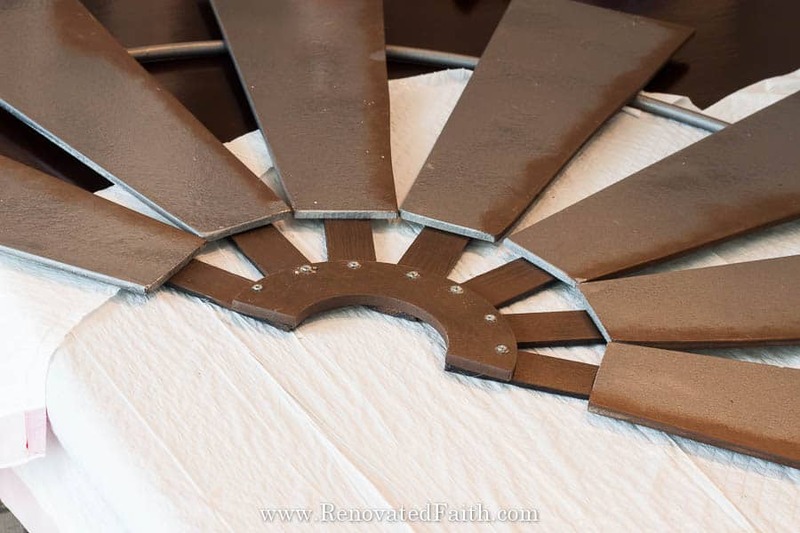 To make a DIY windmill, ceiling fan blades seemed to be the easiest choice of material. I got mine at Restore for only $2 for a set of six! I’m using 7 for my DIY windmill wall art and I got a couple extra in case I messed up. Click here to find your local Restore. You’ll be surprised all they have to offer. 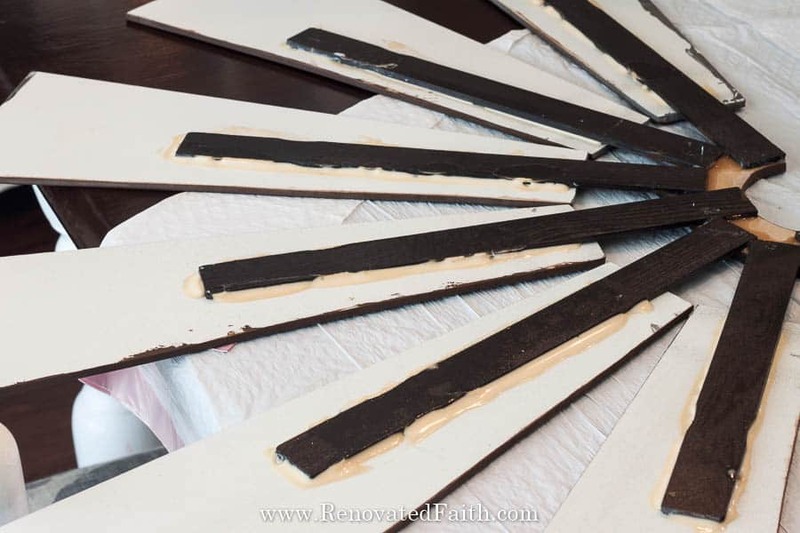 Line up your template to an edge of the ceiling fan blade so that it’s one less edge to cut. Trace the template onto all 7 blades with a pencil. 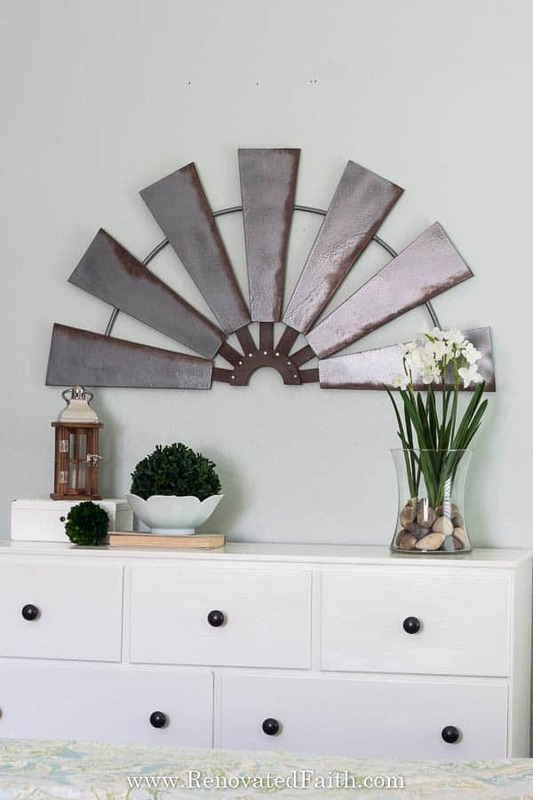 You can use more or less blades for your DIY windmill wall decor. I’m happy to say that this was the first time to ever use a jig saw and it went surprisingly well. Yay for power tools that aren’t intimidating! If I can do it, I promise, anyone can. I highly recommend this jig saw here to cut out your DIY windmill blades. I also wrote a post on how to use a jig saw and made a video below to help you out with using a jig saw if you haven’t used one before. If you are interested in adding to your power tool collection, you can check out my post Best Sanders for Wood Furniture 2018. After you have cut out your fan blades along each line you also want to cut your floral craft ring in half so you have two semi-circles. You will only use one…which is good because my dog Jake managed to chew up the other half. Now that all seven of your blades are cut, it’s time to do some spray painting! 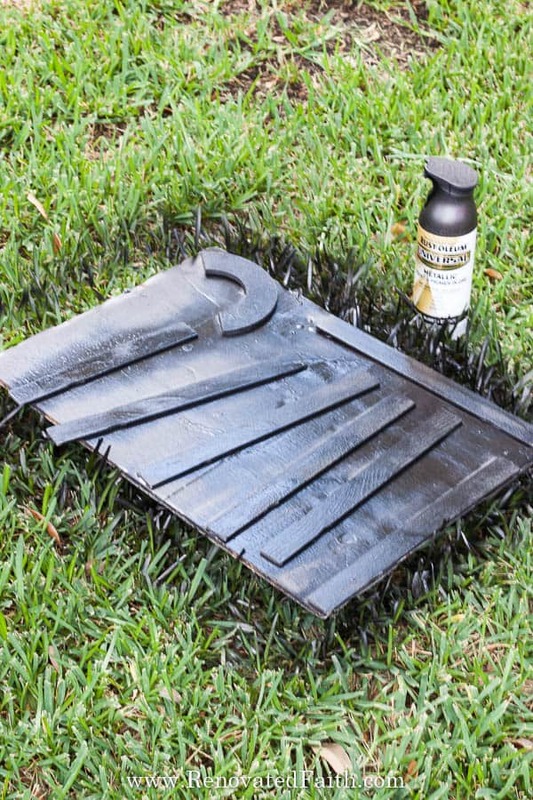 Be sure to lay down an old sheet or piece of poster board and spray in a well-ventilated area. 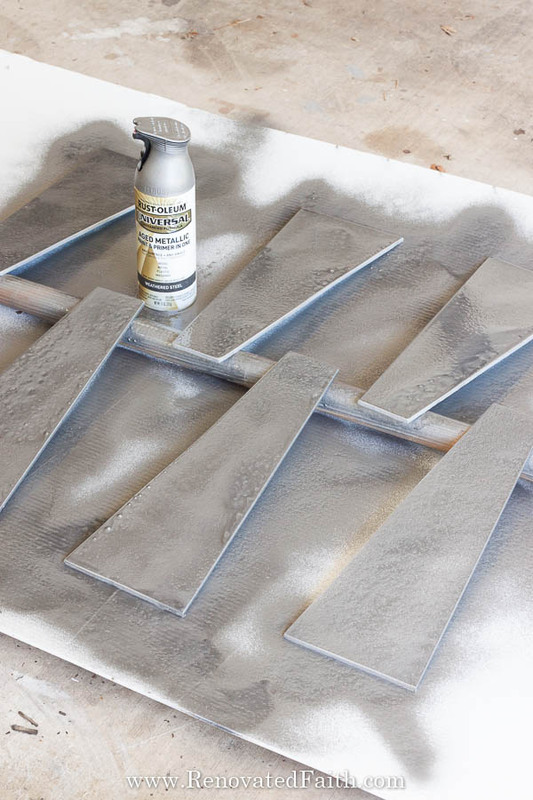 Spray the blades and the pieces of faucet supply line in the Weathered Steel Spray Paint here. I highly recommend using this brand because it looks just like galvanized steel when you are done! 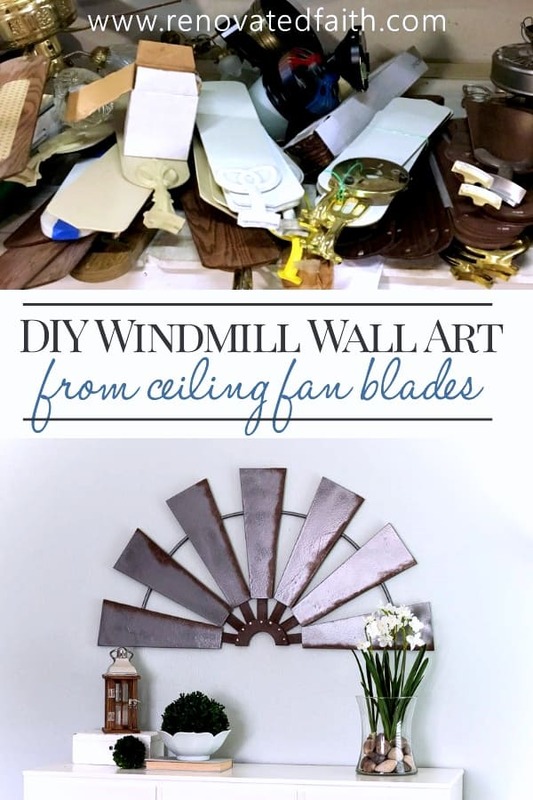 It makes ALL the difference in making those ceiling fan blades look like galvanized metal for your DIY windmill wall decor. Not shown in the image above is the faucet supply line that you also want to spray paint in the weathered steel paint. You also want to spray paint the 7 stir sticks and the half of the floral craft ring in the Brown Spray Paint here. Be sure to separate these items from the other items while spray painting so you don’t have any over-spray. Let them dry at least 24 hours. Step 4: Adding Faux Rust to the Windmill Blades. I wanted to add a little rust to my windmill blades but didn’t want to go crazy with the rustic look. I used a spouncer and 1/3 of a burnt sienna acrylic paint and 2/3 dark brown acrylic paint to give it that rusty look. I mixed the paint and put a little on my spouncer. Then, I wiped off most of the paint off the spouncer so there was only a tiny bit of paint left on it. Then I just kept dabbing the edge to get the look I wanted. I was unsure about this part but it went really smoothly and I think it looks just like real rust! Here is a video to help you out! Also, you’ll notice I only put rust on one side of each blade. This is to give it some dimension to look like the blades are angled like real windmills instead of flat. Now it’s time to get our your Gorilla Wood Glue. I strongly suggest you use this instead of regular wood glue because it has a much tighter bond. Glue the end of the stir sticks to the craft ring and let them dry a day. Then glue the fan blades to the ends of the sticks and let them dry. Don’t be shy with the glue! After the glue underneath dried I actually came back and “caulked” the edges with glue to make sure it had a really strong bond. 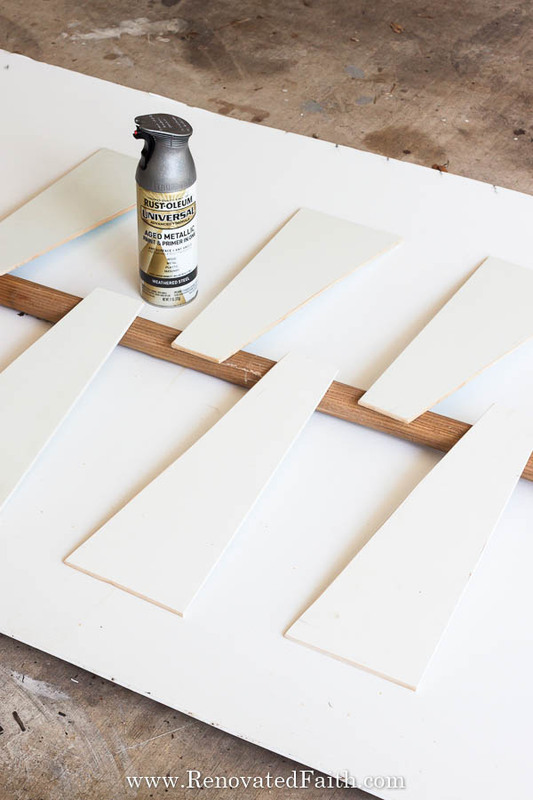 After your glue has hardened, carefully flip over the windmill and you want to add a wood screw below each stir stick into the craft ring to give it extra support. Step 7: Add the Supply Line. 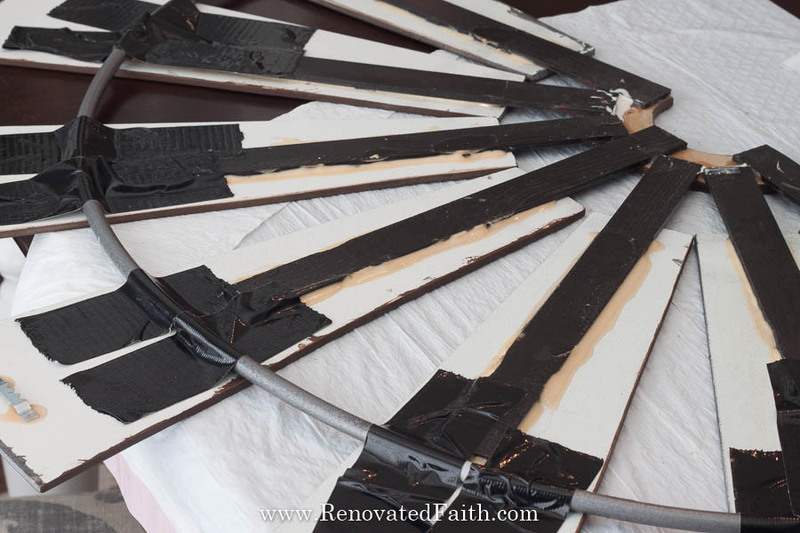 Tape on the faucet supply line to complete the look of your DIY windmill wall decor. I cut the ends off my faucet supply lines with some heavy-duty scissors or you can use branch trimmers. Then, I simply duck taped them to the back of my fan blades. My duck tape happens to be black. 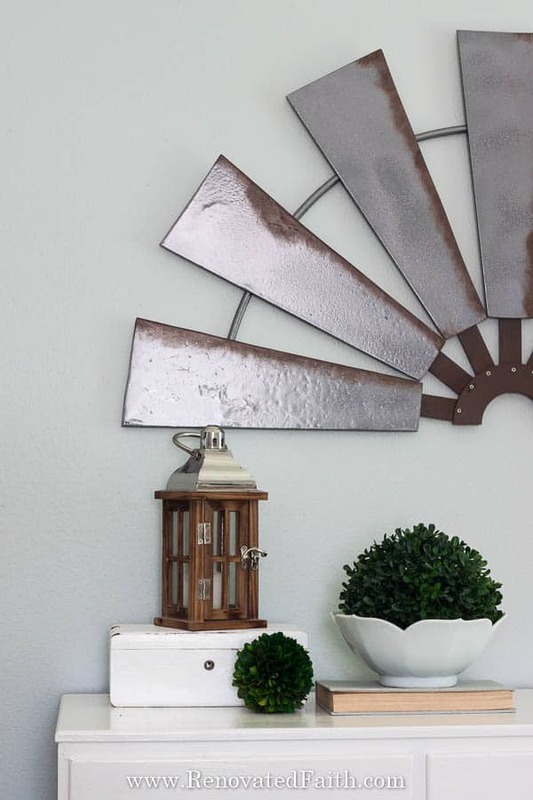 Now you have beautiful windmill wall art that even Joanna Gaines would be proud of! 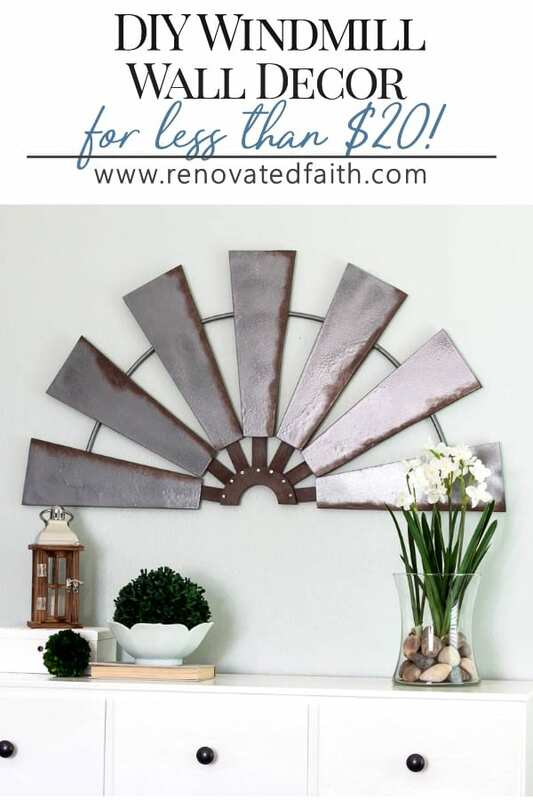 This wall art is easily customizable and it rivals the look of some found in stores for a fraction of the price. It’s hard to believe I spent less than $20 on mine! You might remember those curtain rods from my post on How to Make DIY Custom Curtain Rods from Electrical Conduit. They are still goin’ strong! Even Jake likes it in spite of trying to chew up the floral craft ring. Hasn’t he grown since you first saw him in this post? Wow! What a great job you did in making your decorative half windmill! It is beautiful! Your step by step instructions are clear and easy to understand! 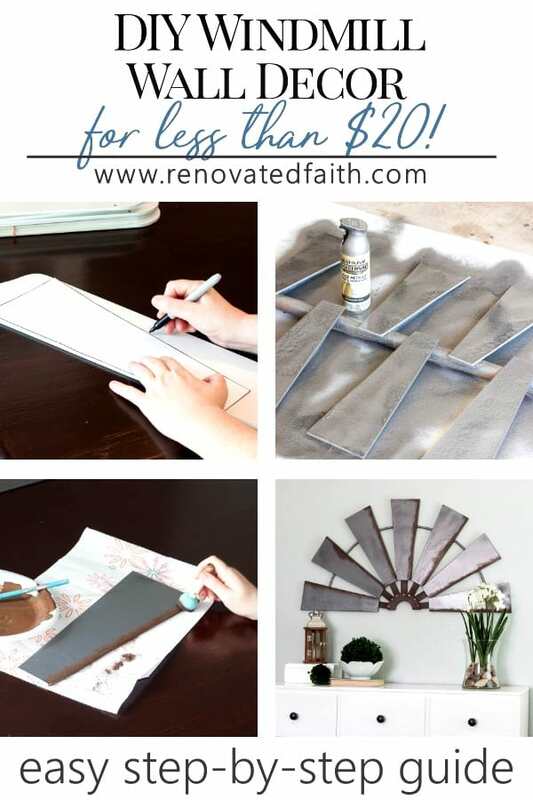 Loving your DIY projects! Wow! That is amazing! And genius! I love how it turned out!!! Thank you so much Elizebeth!